We had an incredible time attending this year’s tour. We spent over a week on the West Coast, going from city to city and attending the shows, meetups plus (and certainly a highlight-bonus) spending time with relatives of the band. Most travelling fans went to at least 2 shows. During these travels, we made a new friend, a professional photoragpher and fellow media maniac. His name is Jason DeBord and he shared his experience at the San Francisco show. Enjoy! Brief Summary: Obviously, the duo have reunited and produced new work, and are in the midst of what appears to be a very successful tour. I definitely have my own associations with the music of the band – a lot of great memories to be sure, and some that simply make me laugh today in retrospect (like going to school dances in middle school and standing along the outskirts of the dance floor like the geeks in Sixteen Candles). 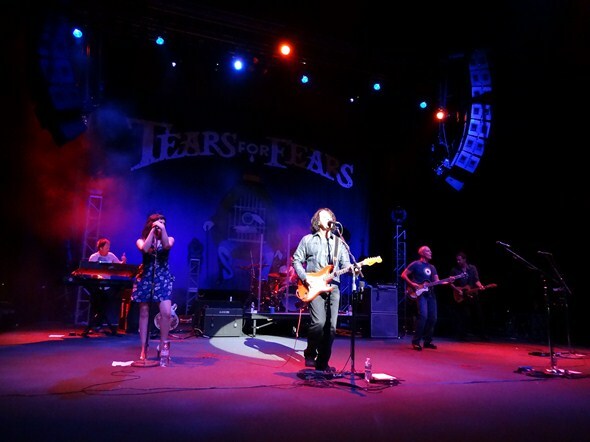 In any event, the concert performance by Tears for Fears tonight was amazing. Also performing with the band was Charlton Pettus (lead guitar), CJ Vanston (keyboards), and Jamie Wollam (drums). It was such an experience to hear all of this wonderful music played live on stage. I loved the way the full set was played tonight. I’ve heard some different renditions of some of the songs from other live performances, and I really feel this performance totally nailed all of them, and would love to see a live Blu-Ray of this set and tour produced some day – it was really that spectacular. Also, Carina Round really added a tremendous amount to the song “Woman In Chains” with her added vocals – truly incredible rendition. It was really just a fun night, and it was a privilege to have such a great seat from which to enjoy it (the benefit of F5ing Ticketmaster as they went on sale, buying just one ticket, and the front rows being composed of three seats – and a little luck). 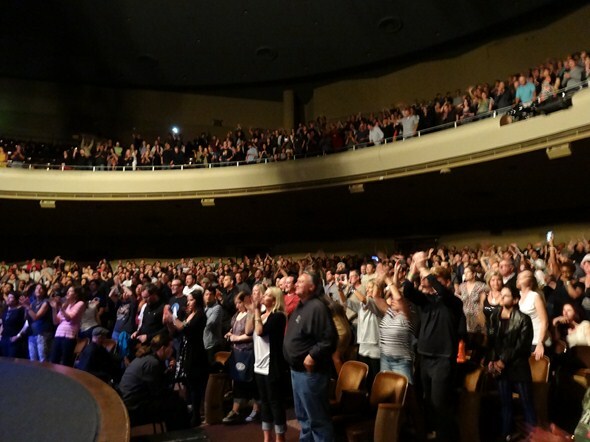 The guys were really funny with some comments and stories in-between songs, and the audience was great and enthusiastic and genuine (and a little odd in a funny way – booing when Mr. Orzabal said that they were in Burbank the night before). Really, I’m not sure what else to say about this one… it was such a thrill and joy to see them, and it’s another one of those shows where you immediately want to see it all again. I can’t recommend enough catching this tour if you have the chance – just fantastic music by a talented band. Even if you aren’t familiar with all of their work, it is all great music and framed throughout by their many hits. Truly a fantastic night. Enjoy these videos on HD video from the concert. Jason, we thank you so much for your kindness and hard work. It is greatly appreciated by fans all over the world. We love this band with so much of our mind, body and soul and can’t imagine life without them. It’s great to share that passion with other media professionals who have the ability to capture it so well. See you next time we trust. *All pictures are the property of Jason DeBord. Please do not download, copy and repost/retweet without alerting Jason and getting a response. If the ethics&fairness team see his photos reposted you will be contacted and questioned. Thanks for understanding. 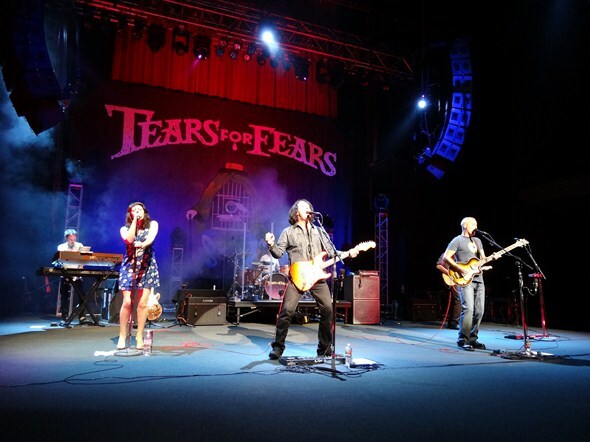 Posted on 08/08/2012 08/08/2012 by International Business and Cultural ExchangePosted in Tears For Fears Live ShowsTagged Concerts, Curt Smith, Jason DeBord, Kooks, Music, Professional Superfans, Roland Orzabal, San Francisco, Tears for Fears, Tears for Fears Fan Club, Tears for Fears Tour 2012, Travelling Fan Club. Next Next post: Happy Birthday, Bonne Anniversaire y Feliz Cumpleanos ila Roland! !